The Sydney Harbour Bridge and the sails on the nearby Opera House went dark Saturday, as lights on landmarks around Australia were switched off for the global climate change awareness campaign Earth Hour. 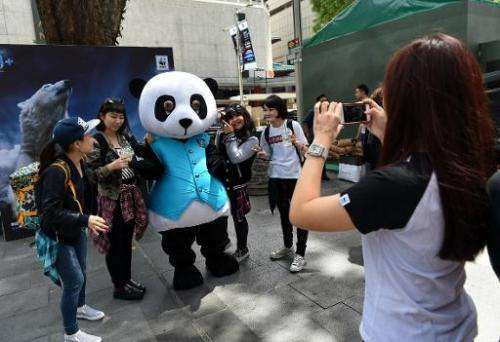 Millions are expected to take part around the world in the annual event organised by conservation group WWF, with hundreds of well-known sights including the Eiffel Tower in Paris and the Seattle Space Needle set to plunge into darkness. 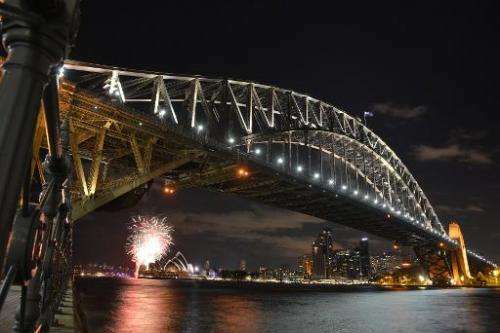 "It's almost like the thing vanished," said Tony Jennings from Earth Hour after standing under the Harbour Bridge as the lights went off at 8:30pm (0930 GMT). In Australia, Earth Hour this year is focussing on farming, with fears that rising temperatures could ultimately damage the country's ability to produce food. "In Australia agriculture is the most vulnerable industry to the impacts of climate change," said national Earth Hour manager for Australia, Anna Rose. Rising temperatures, increased pests and weeds, changes in planting times, and more extreme weather events were already beginning to impact farmers, she said. "People think about climate change as something that's only going to happen in the future," Rose told AFP. "In this Earth Hour campaign we want to highlight the fact that rising temperatures and more extreme weather are affecting something we all have in common—our food." Earth Hour takes place from 8:30pm local time, and encourages citizens, communities, businesses and organisations to switch the lights off for an hour to highlight the plight of the planet. This year it comes ahead of a crucial UN meeting Paris in December which is bringing together the global community in an effort to limit global warming. The initiative began in Sydney in 2007 but quickly went global. "Over 170 countries and territories have already confirmed their participation; more than 1,200 landmarks and close to 40 UNESCO world heritage sites," Earth Hour head Sudhanshu Sarronwala told AFP ahead of the event. These range from the Christ the Redeemer statue in Rio de Janeiro, the Acropolis in Athens, Edinburgh Castle, Big Ben, Ecuador's Quito historical centre to New York's Times Square. Earth Hour's goal is not to achieve measurable electricity savings, but to raise awareness of the need for sustainable energy use, and this year also to demand action to halt planet-harming climate change. I've often wondered if we just turned things off for a day or two if we would notice dramatic effects. What if we just didn't run one day of the week, would this be sufficient to allow the world to recover? It'd be a great experiment, if we could do it; turn the gas and electricity to a minimum and see what effects we could observe, and odd weather patterns, etc..
No. Y can't u take 15min crafting an estimate & consistent with your claim of "4 technical degrees" ? What do we call those who make ego based claims & refuse to prove ? Y is your question NOT commensurate with those who have "4 technical degrees"
Which institute & what years u started please ? Y aren't your uni degrees including claim of "Physical Chemistry" on your facebook page ? Y is your CO2's effect claim of 0.00009W/m^2 some 16,666x Lower than wiki's 1.5W/m^2 ? Y can't U prove your claim "business uses your results" ? Y can't U qualify or prove ANY of your claims ? Y don't U seem to have any integrity Water_Profit ? You want impact? Change the planetary albedo. Paint all roofs white. Shootist, that's not a bad idea either, I mean from the standpoint of every little bit helps. Be careful, AGWers might start to like you if you keep talking like that. G'day mate, will you be turning off the lights? Absolutely mate, and I'll be setting off fireworks to make up for the CO2 and poisoning the harbour all at the same time. That's "brilliant" mate, don't blow your fingers off in the dark. The AGW Cult, we have only just scratched the surface of stupid. WHY can't you confirm any of your claims ? Why do you ignore CO2's 1.5W/m^2 ? How did u craft your erroneous calculations, based on what ? Where did u get those claimed "4 technical degrees" ? While it seems like a reasonable effort. I wonder what impact this has on the generation side which is largely coal powered. They can't exactly spin the turbines down for an hour, so in effect this does nothing to minimise CO2. When a turbine or engine has less load u don't need as much throttle, noticed that ? The quiescent requirement in terms of fuel is a heck of a lot smaller than the turbine can deliver in terms of power. Eg. a 10MegaWatt (10MW) turbine doesn'tt need 10MW to spin with no load.